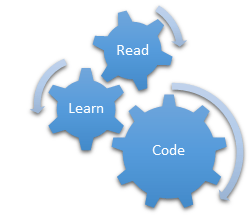 Events are one of the core and important concepts of C# Programming environment and frankly speaking sometimes it’s hard to understand them without proper explanation and example. So I thought of writing this article to make things easier for learners and beginners. An event in a very simple language is an action or occurrence, such as clicks, key press, mouse movements, or system generated notifications. Application can respond to events when they occur. 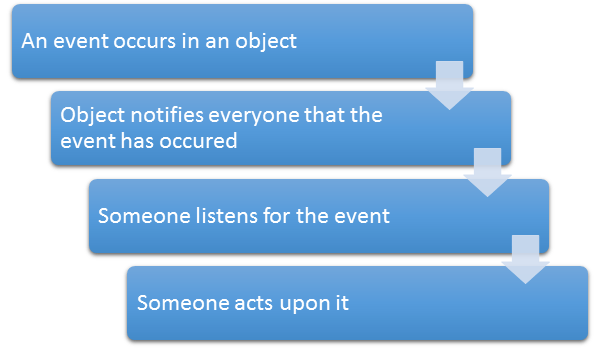 Events are messages sent by the object to indicate the occurrence of the event. Events are an effective mean of inter-process communication. They are useful for an object because they provide signal state changes, which may be valuable to a client of the object. If above sentences were tough to understand let’s put this simple if a button on a form gets clicked by a user an event gets fired, if a user type something on a textbox keys gets pressed and hence an event gets fired an so on. “An event in C# is a way for a class to provide notifications to clients of that class when some interesting thing happens to an object. 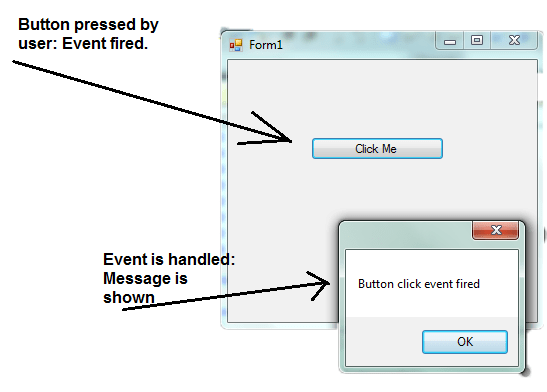 The most familiar use for events is in graphical user interfaces; typically, the classes that represent controls in the interface have events that are notified when the user does something to the control (for example, click a button). 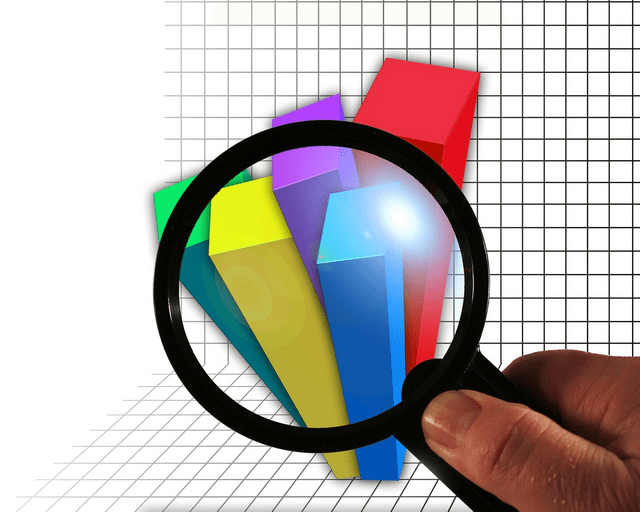 Events, however, need not be used only for graphical interfaces. Events provide a generally useful way for objects to signal state changes that may be useful to clients of that object. Events are an important building block for creating classes that can be reused in a large number of different programs. 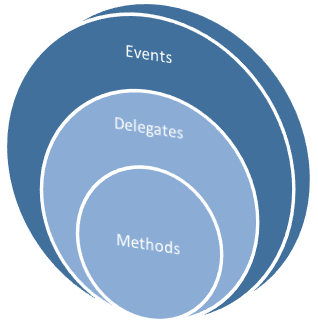 The following figure is the generalized representation that explains events and event handling. In C#, delegates are used with events to implement event handling. The .NET Framework event model uses delegates to bind notifications with methods known as event handlers. 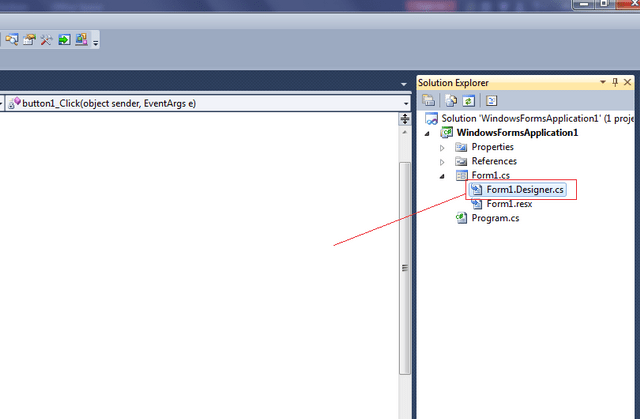 When an event is generated, the delegate calls the associated event handler. Just open your visual studio and create one windows application. You’ll get a form in your windows application project named Form1.cs. Add a simple button to that form, just drag and drop. 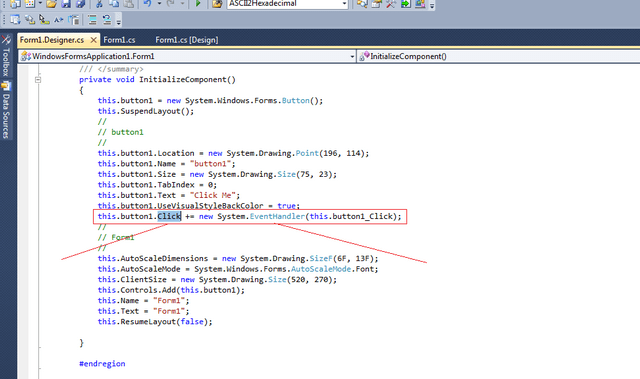 In properties panel of that button, bind the on click event of that button with an event at code behind and show some text on its click. You can browse the attached source code for understanding. As we can see button on the form was clicked by the user and hence button click event was fired which was handled by Delegate which in turn called button_click method (Event handler method) which showed our Message Box. 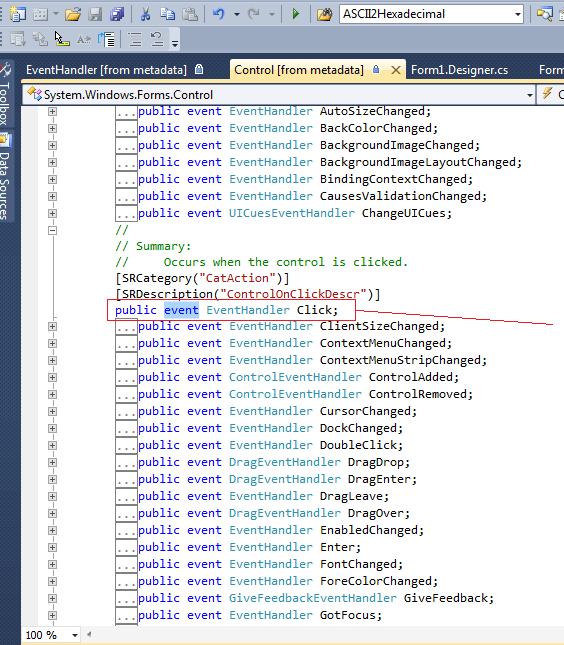 In above example Event declaration, Delegate declaration, Event handler declaration all done by .NET we just have to write code handle to our event in this case code to display message box. If we investigate Form1.Designer.cs and follow the step shown in figure below we can easily find out the event keyword and delegate keyword and hence find out their definition. Since we haven’t seen the definition syntax it might looks alien to you but we will get to it soon but for now just follow the steps in figure. 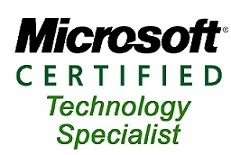 Step 2: In Form1.Designer.Cs Click event and EventHandler delegate. Step 3: Double click this.button1.Click and Press F12 to see Click Event definition, similarly double clickSystem.EventHandler and Press F12 to see EventHandler Delegate definition. The events are declared and raised in a class and associated with the event handlers using delegates within the same class or other classes. 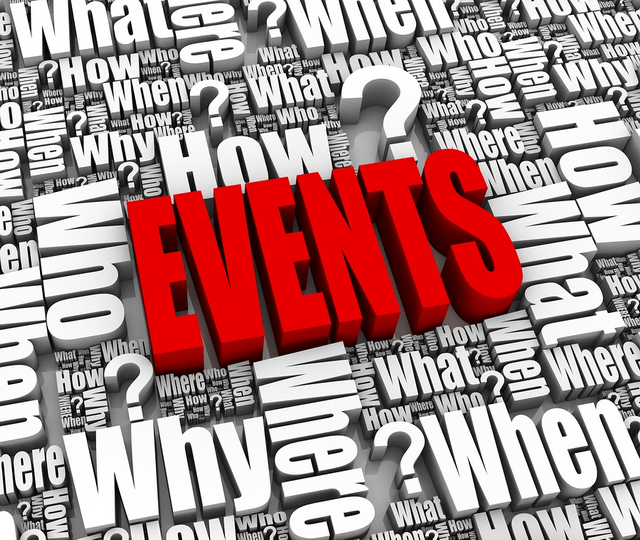 Events are part of a class and the same class is used to publish its events. The other classes can, however, accept these events or in other words can subscribe to these events. 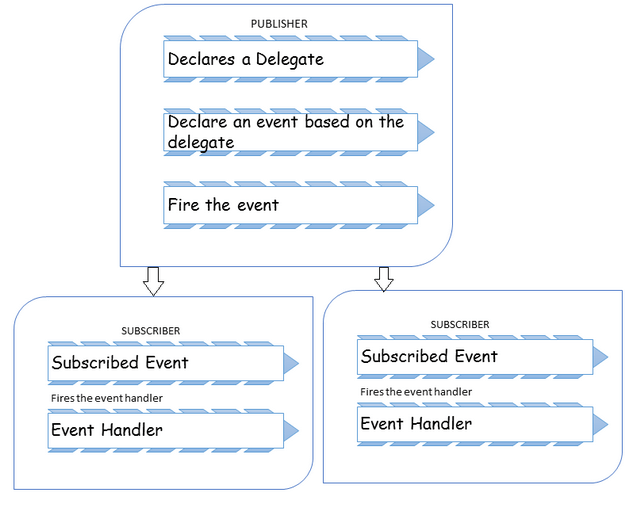 Events use the publisher and subscriber model. A publisher is an object that contains the definition of the event and the delegate. The association of the event with the delegate is also specified in the publisher class. The object of the publisher class invokes the event, which is notified to the other objects. A subscriber is an object that wants to accept the event and provide a handler to the event. The delegate of the publisher class invokes the method of the subscriber class. This method in the subscriber class is the event handler. The publisher and subscriber model implementation can be defined by the same class. Delegates play a very important role in C#, it is one of the entities that can be directly put into a namespace of a class. This quality of delegate makes it accessible to all other classes as well. Delegates work on Object oriented pattern and try to follow encapsulation by enclosing method and object together. Delegate in C# define a class and uses namespace System.Delegate. Delegates are ideal for anonymous method invocation. I’ll discuss events and delegates in more detail in my upcoming articles. The following figure shows the mechanism used by the publisher and subscriber objects. Let’s get our hand dirty by building our own event handling example. In the example below we will see how to define our customized event and how to raise it and how to handle it by our own customized event handler. In our simple example we’ll build a console application for Bank, in which an event TransactionMade is raised whenever the Customer makes a transaction and in response a notification is send to him. Let’s do some serious coding now. First we define our class Account. We can add a constructor to initialize our variable int BalanceAmount which will hold the account balance in our class. Then we define our event and our delegate. As you see, our delegate’s name is TransactionHandler, and its signature contains a void return value and two parameters of type object andTransactionEventArgs . If you somewhere want to instantiate this delegate, the function passed in as constructor parameter should have the same signature as this delegate. When an event is raised we pass some data to subscriber in a class which is derived from. 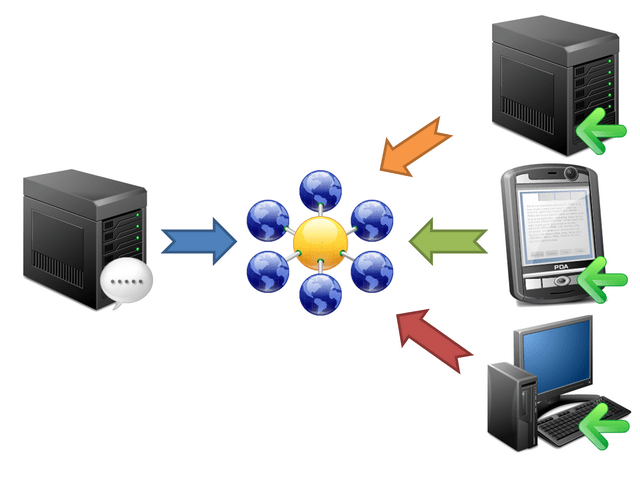 For example, in our example we want to provide the Transaction Amount and the Type of Transaction made. So we define a classTransactionEventArgs which will inherit EventArgs to pass data to subscriber class. We have declared two private variables one int _transactionAmount to pass transaction amount information and other is string_transactionType to pass transaction type (Credit/Debit) information to subscriber class. Now, everything is in our Account class. Now we will define our notifier methods which will be invoke on credit or debit transaction and raise our event. In Debit Method balance amount will be deducted and event will be raised to notify subscriber that the balance amount has been changed, similarly in case of Credit method balance amount will be credited and notification will be sent to subscriber class. And this event will be handled by our event handler. Now let’s define our Subscriber class which will react on event and process it accordingly through its own methods. First create a class named TestMyEvent and define a method SendNotification, its return type and parameter should match our Delegate declared earlier in publisher class. Basically this method will react on event which is change in our balance amount and inform user user (by writing this on console). Now in Main() method of subscriber class create instance of and pass some initial balance amount. Then reference of event handler is passed to the event and method to be called on that event response is passed to the event handler. In our example our Account Class is the publisher which notifies the change in account balance if debit or credit is made as you can see from code we have raised our event in Debit/Credit method and if event is raised then somebody has to act upon it so TestMyEvent Class is the subscriber class in which Debit/Credit transaction is made hence change in Account Balance so it gets notification from the Publisher Class and it acts upon it and handles the event by calling its event handler method SendNotification. So it’s pretty much clear here that events can be defined in one class(Publisher) and several subscriber class can acts upon it depending on their own need. We investigated .NET events and build our own custom event and saw how events are raised and handled. So I wouldn’t be wrong to say that events encapsulate delegates and delegates encapsulate methods. So the subscriber class doesn’t need to know what’s happening behind the curtain it just requires notification from the publisher class that an event has been raised and have to respond accordingly. I hope you are satisfied after reading the article and most of all you enjoyed while reading and coding.